for potential users to "try before you buy"
You must have the Administrative Rights on your computer: right click on the executable file and select Run as administrator. Select modules you want to install. You will be able to install other modules later. 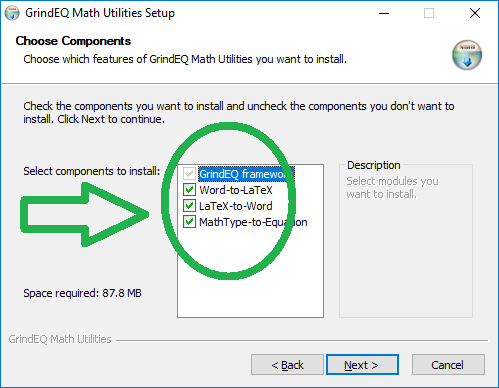 After the installation of GrindEQ Math Utilities is complete, choose the GrindEQ Options from the Windows Start menu. 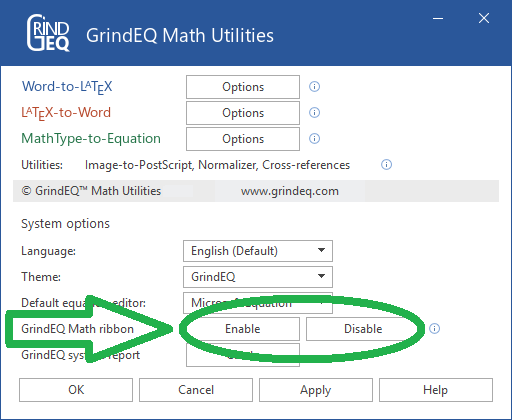 And then enable (or disable) optional GrindEQ Math ribbon, which will be integrated into Microsoft Word. Currently national languages are being prepared for downloading. Everyone is welcome to supply own languages and themes, please visit Languages and themes specifications. Please contact support@grindeq.com for collaboration details.